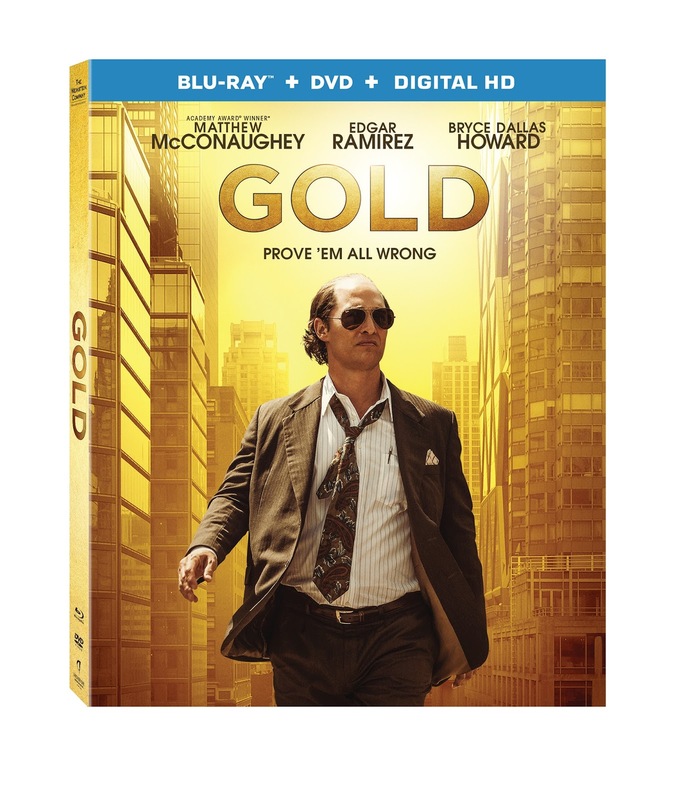 Strike it rich with Oscar® winner Matthew McConaughey (Best Actor, Dallas Buyers Club, 2013) in this fascinating story of dreams and greed when Gold arrives on Digital HD on April 18 and on Blu-ray Combo Pack (plus DVD and Digital HD), DVD, and On Demand May 2 from Anchor Bay Entertainment and Dimension Films. From director Stephen Gaghan (Syriana), and written by Patrick Massett & John Zinman, Gold follows the story of Kenny Wells, a gold prospector desperate to achieve success, no matter the cost. Nominated for a 2017 Golden Globe® for Best Original Song – Motion Picture (“Gold” by Iggy Pop and Danger Mouse), this jungle adventure features an incredibly talented cast, including Edgar Ramirez (Hands of Stone), Golden Globe® nominee Bryce Dallas Howard (Jurassic World), Corey Stoll (“House of Cards”), with Golden Globe® winner Stacy Keach (American History X) and Bruce Greenwood (Star Trek). Gold is the epic tale of one man’s pursuit of the American dream — to discover gold. Oscar® winner Matthew McConaughey stars as Kenny Wells, a prospector desperate for a lucky break, who teams up with a similarly eager geologist, and they set off on an amazing journey to find gold in the uncharted jungle of Indonesia. Getting the gold was hard, but keeping it would be even harder, sparking an adventure through the most powerful boardrooms of Wall Street. The film is inspired by a true story. The home entertainment release is packed with must-see bonus features including: Feature commentary with director Stephen Gaghan, a dynamic deleted sequence of the film, an exploration of the movie’s origins, a journey through Gold’s locations, and a behind-the-scenes look at Matthew McConaughey’s unforgettable performance as Kenny Wells. Gold will be available on Blu-ray Combo Pack and DVD for the suggested retail price of $39.99 and $29.95, respectively. Title Copyright: All Program Content © 2016 BBP GOLD, LLC. All Rights Reserved. Package Design © 2017 Starz Media, LLC. All Rights Reserved. Distributed by Anchor Bay Entertainment, LLC, 2700 Colorado Avenue, Santa Monica, California 90404. Anchor Bay Entertainment, a Starz Company, is a leading independent home entertainment company that acquires and releases a wide array of theatrical and home entertainment content, including STARZ Original series, children's programming, fitness (Anchor Bay Fitness), sports and specialty films on Blu-ray™ and DVD formats. The company has long-term distribution agreements in place for select programming with The Weinstein Company, AMC Networks and RADiUS, among others.